"Unusual Answer from Panelist Receives Standing Ovation at Benghazi Coalition Meeting"
"Mafiosi are 'excommunicated', pope says"
Does that include the MAFIA of Cuba???? Allen Gross who was arrested in Cuba back in 2009, get this...for providing Internet networks for the Jewish community in Cuba. 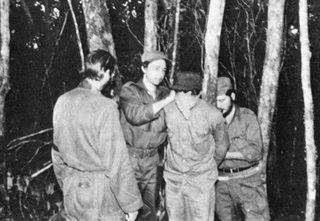 He was sentenced to 15 years in prison by the DICTATORSHIP of Cuba. His mother passes away and Cuba REFUSES to let Allen Gross go to the funeral. Josefina "Vidal Sassoon" Ferreiro, an official at Cuba's Foreign Ministry says that Gross can't go to the funeral "no matter the reason." YET.......Rene Gonzalez, a member of the Cuban Five, A CONVICTED SPY for the Mafia of Cuba, was allowed to return to Cuba to visit his brother, who had lung cancer, and for the funeral of his father. "Dialogue" a term used frequently by the Leftist and the feel gooders as the solution to the problems in Cuba, Venezuela, and the FARC in Colombia. When I was in my early twenties, a certain person in my life would throw out term "DIALOGUE," "LA PAZ" frequently and would proceed to gather every one around for a lengthy round table discussion. Yes, a feel good moment, but these entire episodes would be for this person to impose HIS IDEAS, HIS OPINIONS, AND WHAT SHOULD BE DONE and that was it! Do I need Al Sharpton rhyme to explain what I am trying to get across? The person above about to be executed did not have the luxury of a "dialogue." 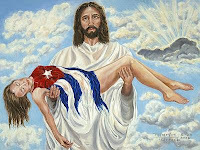 SOS CUBA.........for the last 55 YEARS!!!!!!!!!!!! 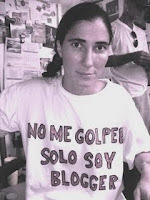 "The list includes some of the people I admire most in all the world — starting with the first name, Antúnez, the moniker of the leader who has been in and out of prison more times than I can count, and who has had the living hell beaten out of him (his wife has, too), and who never, ever breaks (neither does she)." Antúnez and his wife have, once more, been arrested. And brutalized. State security agents told Antúnez that he had become a barrier to the normalization of relations between Havana and Washington . He was strangled and lost consciousness twice. He was also injected with an unknown substance. Before he was released, he was told that he is more at risk than ever. Which is believable. To read a press release from the Directorio Democrático Cubano, go here. To hear Antúnez give his testimony, over the phone (in Spanish), go here. In Cuba , opposition to the lifting of sanctions is punishable by up to 15 years in prison. The 800-some signatories have risked this. I wish that our anti-embargo people here in America would remember this risk, once in a while. Maybe remark on it. They are free to express their view. People such as Antúnez have a different view — and they are not free to express it. If they do, they are strangled, one way or another. Cuban democrats are, honestly, some of the bravest and best people on earth. I hardly have the words to express my admiration for them, or to express my contempt for their enemies.